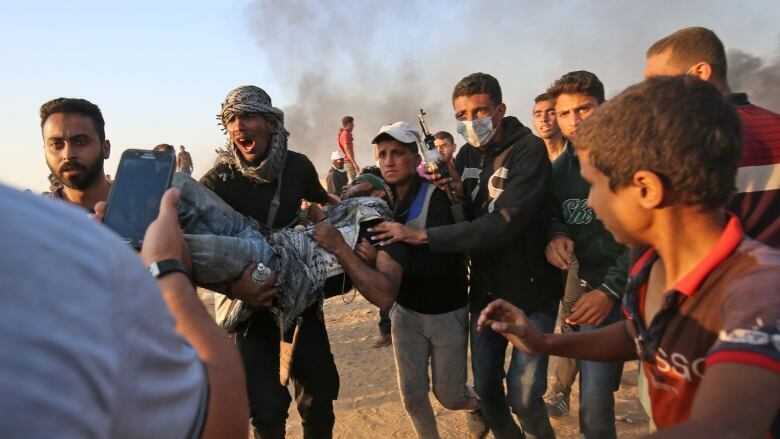 Thousands joined funeral processions today for some of the dozens of Palestinians killed by Israeli troops during a mass march on the Gaza border, as Israel and Palestinian ambassadors to the UN traded accusations of violating international law. The session ended without any joint statement or action. 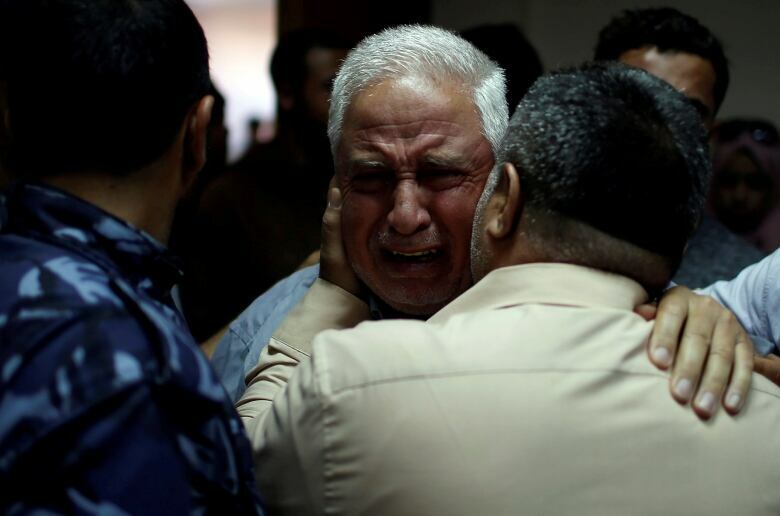 Monday marked the deadliest day in Gaza since a 2014 war there, and was part of a high-stakes campaign by Gaza's Hamas rulers to break a decade-long border blockade. Israeli forces killed 59 Palestinians, most by gunfire, and injured more than 2,700 on Monday, Gaza Health Ministry said. The ministry said some 1,360 were hit by gunshots, and that of the injured, 130 were in serious or critical condition. CBC's Derek Stoffel said there were smaller numbers of Palestinians turning out to the barrier separating Gaza from Israel on Tuesday. Some Palestinians pressed up close to the fence, Stoffel said, and the Israelis responded with crowd control measures including tear gas fired by soldiers and from drones. Watch CBC's Derek Stoffel's report from Gaza. 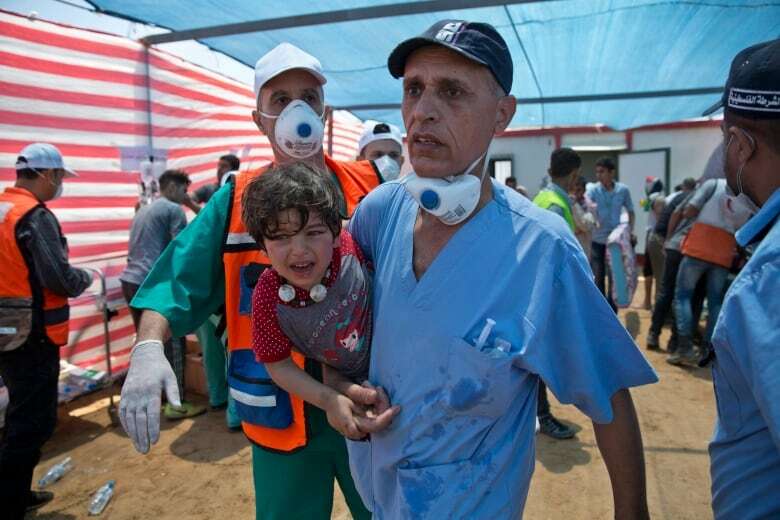 Gaza's health officials said two Palestinians were killed Tuesday by Israeli gunfire during protests near the border. 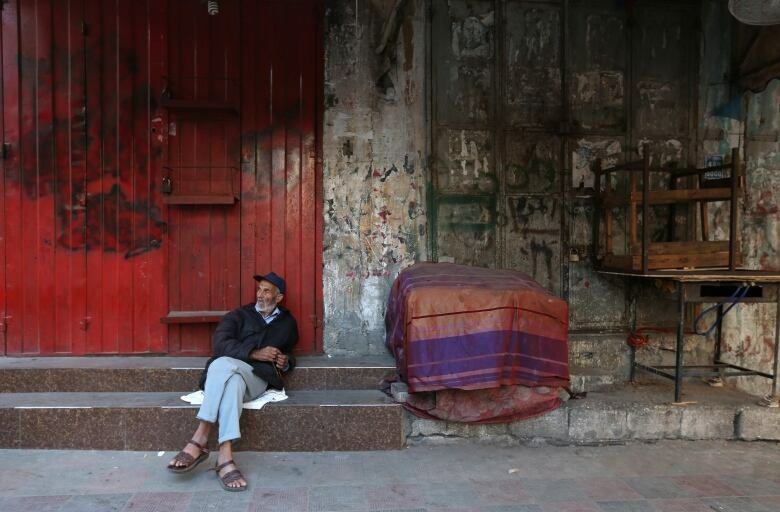 Stoffel said that inside Gaza it was "a day of mourning, it is a day for funerals." The high casualty toll has revived international criticism of Israel's use of lethal force against unarmed protesters. Rights groups have said Israel's open-fire orders are unlawful under international humanitarian law. Israel's military says it is defending its border and has accused Hamas of using protests as a cover for attacks on the border. 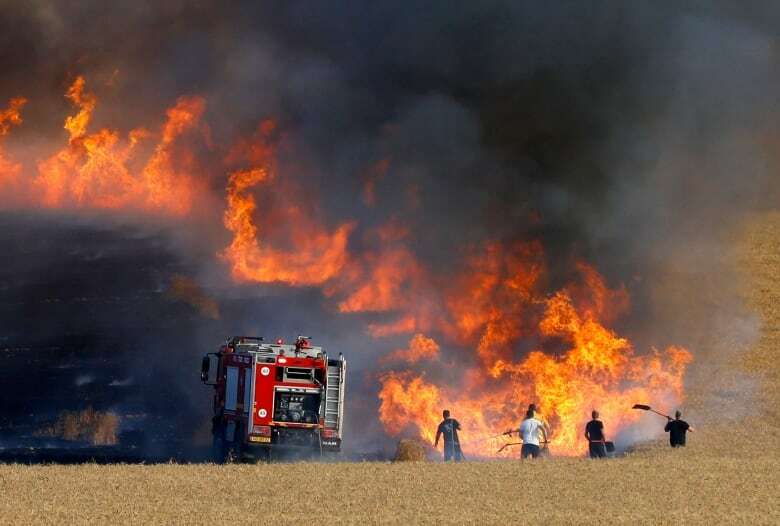 The Israeli Defence Force said on Twitter Monday that "many rioters attempted to infiltrate Israel, approx 10 explosive devices & several firebombs were used, & numerous shots were fired." The military has said rubber-coated steel pellets, at times used for non-lethal crowd control, are not effective in preventing Gaza demonstrators from approaching or breaching the border fence. "We regret every casualty, but they are being used by Hamas," said Danny Danon, Israel's ambassador to the United Nations. United Nations secretary general Antonio Guterres called it a "terrible tragedy" which demonstrated the urgency for a political situation in the Mideast. Guterres, during a visit to European Union headquarters in Brussels. urged "a two-state solution allowing Palestinians and Israelis to live in peace and security together." The UN Security Council met Tuesday in a session called by Kuwait to discuss the violence, beginning with a moment of silence for the dead. Israel isn't a council member, nor are the Palestinians. The UN's Mideast envoy, Nickolay Mladenov, told the council "there is no justification for the killing." He called on Israel to "recalibrate" its use of force and to use lethal force only as a last resort. Palestinian Ambassador Riyad Mansour addressed the council: "How many Palestinians have to die before you take action?... When are you going to act?" Danon told the council: "You must tell Hamas that violence is not the answer." Monday's protest also targeted the opening of the U.S. Embassy in Jerusalem, viewed by Palestinians and many in the Arab world as a major affront. The opening of the embassy, condemned by Palestinians as blatantly pro-Israel, further dimmed prospects of what President Donald Trump had once touted as plans to negotiate the Mideast "deal of the century." The juxtaposition of violence on the Gaza border and festivities attended by a high-powered Trump administration delegation just several kilometres away and captured on split screens in TV broadcasts around the world, briefly drew attention to the plight of Gaza and its two million people. Belgium Prime Minister Charles Michel linked the violence on the border with the Trump administration's decision to relocate the embassy. Michel said discussion of the violence and killings would be moved onto the calendar of the European Union summit in Sofia, Bulgaria, on Wednesday and Thursday. The U.S. defended the action of its allies at Tuesday's UN session in New York. "Who among us would accept this type of activity on your border? No one would," U.S. Ambassador Nikki Haley said. "No country in this chamber would act with more restraint than Israel has." "We reject this description of peaceful Palestinian demonstrations," he said. "All they do is seek to exonerate Israel, the occupying power, from its responsibility. 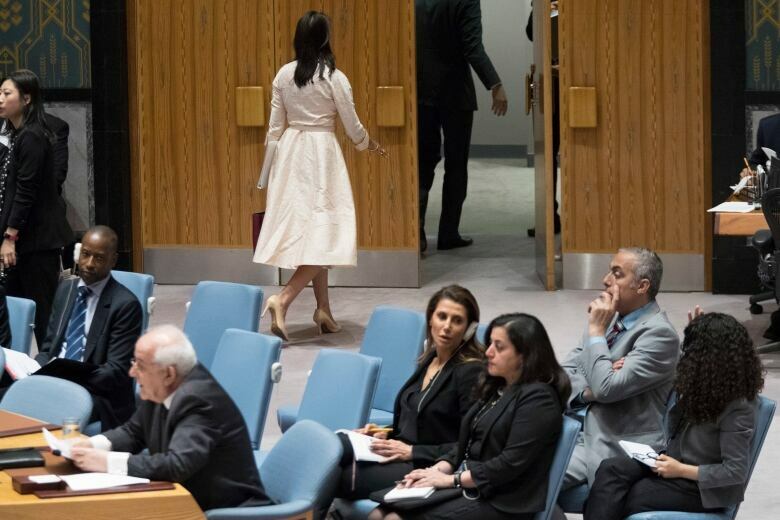 Before Mansour spoke, Haley left the session. Prime Minister Justin Trudeau, when asked Tuesday whether he thought Israel had used excessive force, said his thoughts and concerns were with the victims. "We are calling for a stop to the violence, a de-escalation of the violence in the region right now," the prime minister said. "We know that the only way forward is through direct negotiations between Palestinians and Israelis to get to a two-state solution that is mutually agreed on by both of them." For Hamas, which seized Gaza in 2007, Monday's border protest was the culmination of a weeks-long campaign to try to break the blockade. The group led weekly protests near the border with Israel since late March as part of the push. Thousands joined funeral processions Tuesday, though many of those killed Monday had been buried the same day, in line with Muslim traditions of speedy burials. Tuesday marks the 70th anniversary of what Palestinians call their "Nakba," or catastrophe — the uprooting of hundreds of thousands in the Mideast war over Israel's 1948 creation. In the West Bank, sirens sounded for 70 seconds Tuesday to mark the Nakba. The border marches are seen as Hamas's last hope of ending the blockade that has made it increasingly difficult for the group to govern. Other tactics, including three cross-border wars with Israel in a decade and reconciliation with Hamas's chief Palestinian rival, West Bank-based President Mahmoud Abbas, have failed. The new wave of injured placed a new burden on Gaza's already struggling hospitals where key medicines and surgical supplies were lacking even before the latest bloodshed, in part because of the border closures. Hospitals and other key installations in Gaza, such as sewage treatment and water pumping stations, heavily rely on generators because of hours-long power cuts every day. Gaza's power crisis was further aggravated last week when Palestinian vandals destroyed the fuel terminal at Israel's only cargo crossing into Gaza, halting the flow of fuel and gas. Israel said Tuesday the military has delivered eight trucks full of humanitarian aid and medical supplies to the Gaza Strip. Cogat, the military body for Palestinian civilian affairs, said it has transferred 48 tonnes of medical equipment to Gaza this week, including medical fluids, bandages and physical therapy treadmills. It said fuel will be distributed later.